Deluxe Arcade Simulators on Special! We have a range of deluxe and high end Arcade Simulators on special including Trans-Force Orion 5D Attraction (4 Seat Model), Venturer S2 Simulator Machine and XD Theater 3D Motion Simulator. Trans-Force Orion 5D Attraction (4 Seat Model) is a 5D interactive motion simulator which offers a variety of different games. The machine is suitable for all ages, and includes both entertainment and educational programs. The machine includes a huge 180° panoramic stereoscopic 3D screen, and uses the latest stereoscopic technology to provide high-quality, high-contrast images. 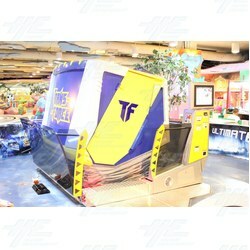 The Venturer S2 Simulator Machine features theme park quality simulation technology in a compact 2 player arcade simulator machine, making it newly accessible for arcade centres and other commerical locations. Up to 2 players ride in the futuristic Venturer S2 capsule as they enjoy a selection of 5 different movie ride experiences. The visuals come to life thanks to to the S2's fully integrated motion system, wide screen display and crisp sound quality. XD Theater 3D Motion Simulator is a multi-seat 3D motion simulator from TrioTech Amusement. The ride features high definition motion-based entertainment films. The original XD Theater package includes three 3D films: Cosmic Coaster, a wild roller coaster thrill ride through space; Haunted Mine, a spooky and mysterious adventure ride through an old, haunted and broken-down gold mine; and Arctic Run, a bobsled-coaster ride through the glacial landscapes of the Arctic. All of these machines are in great condition and are the perfect addition to any arcade or gaming facility. Machines are located in Australia and overseas, we are just looking to clear out machines. This is a very special offer and is a great time to purchase a high end deluxe simulator at a low price. This wont happen again! For more information on these products please follow the links below.